The 2012 Toyota Tacoma gets a refreshed front-end design with a redesigned hood, grille, headlamps and front bumper, among other changes and updated interior with a black high-contrast center console, switch plate covers, dash and upper door trim, while the SR5 grade features a new seat fabric design. Also new for the 2012 Tacoma is New Audio Systems with Bluetooth®, Satellite Radio and USB and Heavy-Duty All-Weather Flooring. 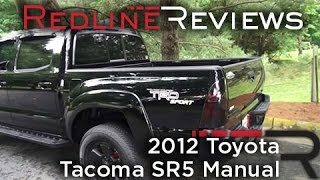 The Toyota Tacoma, still the best-selling compact pickup truck in the U.S. market by a wide margin, offers a restyled exterior look and a redesigned, upgraded interior in all models for 2012. New changes add comfort, usability and audio/infotainment performance. 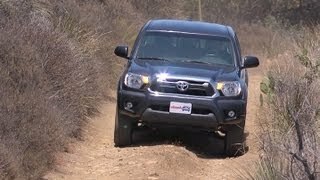 Toyota sold more than 106,000 Tacoma models for 2010, outselling its nearest competitor by nearly two-to-one. For 2012, Tacoma shows a fresh face with a redesigned hood, grille, headlamps and front bumper, among other changes. Inside, customers will find a new center-instrument panel design with a revised gauge cluster, along with a new steering wheel. A redesigned center stack adds new air conditioner/heater controls and power point locations. The 2012 Tacoma interior also gets a new look with a black high-contrast center console, switch plate covers, dash and upper door trim, while the SR5 grade features a new seat fabric design. With owners using their trucks for hard work and hard play, Tacoma offers new heavy-duty all-weather flooring in the 2012 Tacoma Access and Double Cab models, while the more specialized TRD Sport and Off-Road models offer new water-resistant fabric protection seats. The TRD Sport Package adds side mirrors with turn-signal lamps for 2012, as well as available chrome-clad 18-inch wheels. Details that add up to more comfort and function include a larger, higher-resolution display for the available back-up camera (3.3-inch vs. 2.4-inch), a new temperature gauge, available rear-view mirror with compass and HomeLink, vanity lamps added to sun visors, an additional overhead storage compartment and, on Access Cab models, a new rear-console storage box. All models now feature two front-deck “D” rings for added versatility. The 2012 Tacoma is available in a wide variety of configurations and models, and this focus on customer choice has been instrumental in the vehicle’s continued market leadership. Many models offer a choice between four-cylinder and V6 engines, and 2WD and 4WD drivetrains. 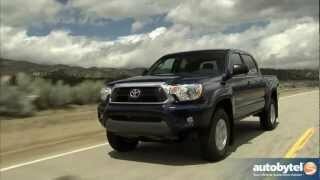 The Toyota Tacoma has been repeatedly recognized for its outstanding value and reliability. Tacoma was named “Most Dependable Midsize Pickup” in the J.D. Power & Associates 2011 Vehicle Dependability Study, and Intellichoice called it a “2011 Best Overall Value” in the compact pickup segment. Toyota has upgraded audio options for some 2012 Tacoma models. Access Cab models offer a new available six-speaker system with an AM/FM/ Satellite Radio-capable head unit with a single-disc CD player. Built-in Bluetooth® allows hands-free phone, and a USB port enables connection of an iPod®, MP3 player or flash drive with music files. The DoubleCab V6 models offer a more advanced display audio system with today’s most in-demand connectivity features. These include navigation, Toyota Entune™ services, SiriusXM Satellite Radio (with 90-day trial subscription), HD Radio with iTunes® tagging and text/e-mail-to-voice. This premium infotainment system plays through a JBL® GreenEdge audio system with seven speakers. GreenEdge technology helps reduce fuel consumption by lowering the electric power demand on the vehicle. The Toyota Entune system is a collection of popular mobile applications and data services, with three years of complimentary access. Once a smart phone is connected to the vehicle using Bluetooth wireless technology or a USB cable, Entune’s features are operated using the vehicle’s controls or, for some services, by voice recognition. Entune includes Bing™ and Pandora®; real-time info including traffic, weather, fuel prices, sports and stocks. Apps available in spring 2012 at no charge include iHeartRadio, MovieTickets.com and OpenTable®. See toyota.com/entune for details. The 2012 Tacoma line offers two engines: a 2.7-liter Dual Overhead Cam (DOHC) four-cylinder that produces 159 horsepower and 180 lb-ft. of torque, and a 4.0-liter DOHC V6 that provides 236 horsepower with 266 lb-ft. of torque. In both engines, variable valve timing with intelligence (VVT-i) provides strong low-end and mid-range torque. An Electronic Throttle Control System with intelligence helps optimize performance and fuel economy. The V6 can be teamed with either a six-speed manual or a five-speed automatic transmission. Four-cylinder models offer a choice between a five-speed manual and a four-speed automatic transmission. When equipped with a V6 Tow Package, Access Cab models boast a maximum tow capacity of up to 6,500 pounds. The Tacoma X-Runner performance truck, unique in the entire compact truck category, returns for 2012 and features the 4.0-liter V6 engine with a specially tuned chassis. Featuring a six-speed manual transmission, the X-Runner can accelerate from 0-to-60 mph in less than seven seconds. Just as impressive, the Tacoma X-Runner can achieve lateral acceleration in excess of 0.9-g – comparable to many performance cars. The X-Runner's Access Cab design incorporates a full body kit, a hood scoop and integrated fog lamps. The color-keyed monochromatic exterior comes in three colors – Barcelona Red, Black Sand Pearl and Nautica Blue Metallic, which is new for 2012. To take performance even higher, TRD offers a 4.0-liter V6 supercharger kit capable of generating 304 horsepower and 334 lbs.-ft. of torque also available for other Tacoma V6 models). The design uses Eaton Roots-type rotating components in a one-piece supercharger plenum/manifold casting. The supercharger is fully warranted for up to five years or 60,000 miles or the remainder of the powertrain warranty at the time of installation when installed by a Toyota dealer. The T|X and T|X Pro Packages, available in conjunction with the TRD Off-Road Package, add a concept-truck look to the Tacoma V6 Access Cab or V6 Double Cab PreRunner and 4x4 models. The T|X Package gives the Tacoma a menacing look and additional sportiness with TRD 16-inch black alloy bead-lock wheels and 265/70R16 BFGoodrich Rugged Trail tires. Black tube-side steps, a stainless steel exhaust tip and unique exterior graphics give the T|X the aesthetics of a custom truck. The T|X Pro is the performance-oriented package by also including a TRD cat-back performance exhaust system that gives the V6 a throatier sound and a bit more power. The T|X and T|X Pro Packages offer a strong value compared to offering the contents as separate accessories, especially considering that they are covered under Toyota’s standard three year/36,000-mile comprehensive vehicle limited warranty and can be financed. The TRD Off-Road Package underlying both T|X editions provides a carefully tuned balance of off-road performance and on-road handling. Chassis modifications include an electronic locking rear differential, progressive-rate front springs, specially tuned Bilstein shock absorbers, a 28-mm front stabilizer bar and BFGoodrich Rugged Trail tires. Fog lamps top off the package for a tough, sporty appearance. Both the TRD Off-Road Package and TRD Sport Package have a 400W/115V powerpoint in the bed; sport seats with adjustable lumbar support and unique fabric, and an overhead console with a compass and outside temperature display. Double Cab and Access Cab models also offer a back-up monitor system. Standard on all Tacoma models is the Toyota Star Safety System™, which includes Vehicle Stability Control (VSC), Traction Control (TRAC), an Anti-lock Braking System (ABS), Electronic Brake-force Distribution (EBD), Brake Assist (BA), and Smart Stop brake override technology. Every Tacoma has standard three-point seatbelts for all seating positions, front seat-mounted side airbags, roll-sensing side curtain airbags (including a cutoff switch), and a front advanced dual-stage airbag system. A front passenger cutoff switch is standard on Access Cab models. All Access Cab and Double Cab models feature standard active headrests for the front seats, which move up and forward almost instantly in the event of certain rear-end collisions to help reduce the distance between the occupant's head and the headrest. The TRD Off-Road Package available for 4x4 V6 automatic models includes Hill-start Assist Control (HAC) and Downhill Assist Control (DAC). HAC operates by independently controlling the brakes at each wheel as needed to help prevent the vehicle from rolling backward or slipping sideways during a transition from a stopped position to climbing a grade. An Automatic Limited-slip Differential (Auto-LSD), which uses brake intervention to help reduce tire slippage at the rear wheels, is standard on all Tacoma models. DAC uses engine braking to regulate downhill speed and independently control the brakes at each wheel to help improve directional control. DAC automatically de-activates if the driver depresses the brake or accelerator pedals, presses the DAC button, or shifts into neutral. TRD Off-Road Packages feature a locking rear differential that can be activated by a switch in the cab. An electronic rear differential is available on 4x4 models and the PreRunner. The well-equipped 4x2 Regular Cab model features standard air conditioning; a full-size spare tire; AM/FM CD four-speaker sound system; tachometer; digital clock; two instrument panel powerpoints with a lighter; dome lamp; and rear mudguards. Regular Cab 4x4 models with the automatic transmission feature standard bucket seats. Tacoma Access Cab and Double Cab models add more standard features, including power windows and door locks, bucket seats and a center console. In Double Cab models, power mirrors and driver seat adjustable lumbar support are also standard. For both Access and Double Cab models, the available option combinations are built on five core packages. The SR5 Package bundles styling and comfort features, including color-keyed overfenders and front bumper, chrome grille surround and chrome rear bumper, intermittent wipers and upgraded interior features and trim, including a leather-wrapped steering wheel and automatic transmission shift lever. The TRD Sport Package is road-focused and features its own specific suspension tuning and lower-profile 265/65 R17 tires on 17-inch alloy wheels. 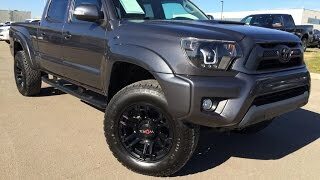 This package also gives Tacoma a sporty look with fog lamps, hood scoop, TRD graphics and color-keyed rear bumper, mirrors, grille surround and door handles. The available dealer-installed TRD Big Brake system was developed by Toyota Technical Center and TRD engineers. Engineered to provide effective braking performance under sustained heavy use, the Big Brake system dramatically improves pedal feel. The system uses 13 x 1.25-inch semi-floating vented rotors with directional internal fins, forged aluminum four-piston fixed calipers, larger pads with high coefficient-of-friction material and braided steel lines. The 2012 Tacoma has a new look from the A-pillar forward, with new front grilles on all grades. In addition to a new hood, Tacoma also receives new headlamps, new upper and lower bumper areas, including an updated fog lamp housing. Tacoma configurations are based on three cab types: Regular Cab, Access Cab, and the four-door Double Cab. The rear doors on Access Cab models open to 80 degrees to give passengers easy ingress and egress. Bold overfenders distinguish PreRunner and 4x4 models. PreRunner models combine the 4x2 drivetrain with the 4x4's raised riding stance and styling. Double Cab models offer a roof rack system with crossbars that deploy from the roof rails. Tacoma Regular Cab models are built on a 109.6-inch wheelbase; 4x2 Access Cab models (including PreRunner and 4x4) ride on a 127.4-inch wheelbase. The Tacoma Double Cab with the standard five-foot bed shares the 127.4-inch wheelbase, while the Double Cab long-bed models use a 140.6-inch wheelbase. The Tacoma Regular Cab and Access Cab models feature a 73.5-inch-long bed. The Double Cab is available with a choice of a 60.3-inch bed or the 73.5-inch bed. The Tacoma's composite inner bed is made from a sheet-molded composite (SMC) deck and tough and durable walls that are 10 percent lighter than steel. The bed deck features two-tier loading and an integrated deck-rail utility with four standard adjustable tie-down cleats. The rails are compatible with Genuine Toyota Accessories, including cargo bed cross bars, a fork-mount bike rack, and diamond-plate storage boxes. An available 115V/400W powerpoint further extends the bed's utility. A redesigned instrument gauge panel lends a sporty look in all models for 2012. The center console (standard on Access Cab and Double Cab models) flows into the instrument panel for a unified appearance. The console integrates three cupholders, two of which can accommodate extra-large containers. Tacoma’s interior provides durability and comfort with high-grade fabric and generous standard equipment. Sound absorption material in the headliner and behind the rear seats, along with insulating carpeting, help to provide a quiet cabin. All Tacoma models provide dual bottle holders in driver's- and passenger's-side doors. Audio controls are mounted high for easy access. Higher-grade models feature fabric-covered sun visors and an overhead console with map lights, as well as compartments for sunglasses and a garage door opener. Interior storage is maximized in Access Cab models with fold up rear seats and underseat storage. Double Cab models feature 60/40 split rear seats with adjustable headrests and under-seat storage. Toyota’s 36-month/36,000 mile basic new-vehicle warranty applies to all components other than normal wear and maintenance items. Additional 60-month warranties cover the powertrain for 60,000 miles and corrosion with no mileage limitation. The Camry will also come standard with Toyota Care, a complimentary plan covering normal factory-scheduled maintenance and 24-hour roadside assistance for two years or 25,000 miles, whichever comes first.